Contact Pete Morrison, K6VVR or John Broughton, WB9VGJ for more information on the monthly YARC fox hunts. The Yavapai Amateur Radio Club holds a monthly 2M fox hunt. The hunt is currently on the Sunday after the YARC member meeting. However, the day is subject to change depending on conditions that may arise. Any changes to the date or time will be accounted at the club meeting and might be in the club newsletter if the change is known about far enough ahead of time. Pete, K6VVR, and Jim WB7UZV, were the driving forces behind the monthly fox hunts. The result has been lots of fun and camaraderie for the club members. The rules and procedures for the the fox hunt are rather straightforward. Normally, two transmitters are hidden. The primary transmitter transmits on 145.100 MHz with a power of 500MW. The secondary transmitter transmits on 146.565 MHz with a power of 100MW. The transmitters must be hidden within a 7.5-mile radius of the starting point, which is the parking lot of the One Arizona Credit Union, 1335 Gail Gardner Way. The hunt begins at 1:00PM. Hunters assemble at the parking lot and when they have received the primary transmitter’s signal, have a bearing they are ready to start the hunt. At this time they call the fox on the clubs repeater, 146.880 MHz, PL 100.0 Hz. to report they are starting the hunt and to give the fox their odometer mileage. For deciding the winner, only the time taken to find the primary transmitter is considered. The person/team finding it in the shortest amount of time will be the winner. Should more than one person/team find the transmitter with the identical time, the person/team with the fewest miles driven will be judged to be the winner. The secondary transmitter is hidden in proximity of the primary transmitter. The club has access to several transmitters. Various ones are used for the secondary transmitter. They are small and can be easily hidden and it can be somewhat difficult to locate them as club member some up with ingenious ways to hide them. Also, a variety of antennas are used with both the primary and secondary transmitter, which can make the hunts more interesting. The main purpose of having a secondary transmitter is to give hams more experience in “sniffing” out a transmitter once they have gotten in the general area where it is hidden. The monthly foxhunt was held Sunday, April 7th. Pete, K6VVR, and Patrick, KG7EWD, were the foxes. 1 WB7RFY, WB7RRQ and WB9VGJ 53 min. The foxes hid the transmitters at the end of La Questa, a dead end street in Southview subdivision just south of Pioneer Parkway on the east side of Williamson Valley Road. The foxes used a beam antenna for the primary transmitter and aimed it toward Embry-Riddle Aeronautical University and Mingus Mountain. That put the null pointing toward Williamson Valley Rd. providing a weak signal in that direction. That made hunters think they were not close to the transmitter when then drove past the entrance to the subdivision. Te SigTrax app I have on my cellphone came in very handy in helping our team find the transmitter. The first two bearings had a cross point at Williamson Valley Rd. and Pioneer Parkway. The weak signal on Williamson Valley Road fooled us, but after driving west on Iron Springs Rd. and North of Pioneer Parkway on Williamson Valley Rd. we determined the transmitter had to be in the area of the intersection. We then stopped at the overlook on Pioneer Parkway and took another bearing, which was dead south and created a cross point with one of the other bearings in the Southview subdivision. It turns out that this cross point was almost exactly where the transmitter was. You can see in the screenshot from my cellphone below how close the cross point was to the actual transmitter. The other team did not finish. This is one time WA6FBA’s Doppler system did not lead him directly to the transmitter. The team called in and asked for the location as they were not being successful in finding it. They arrived one hour and 16 minutes after they started the hunt. They did, though hunt for the secondary transmitter and found it. All in all it was an interesting and challenging hunt. We had our usual after hunt socializing session at Prescott Junction. We would encourage more folks to get involved in the hidden transmitter hunts. They are really fun and help develop direction-finding skills. The monthly foxhunt was held Saturday, March 16th. Robert, WA67FBA, and Bob, WB6ODR, were the foxes. 1 K6VVR, WB9VGJ, KG7EWD 25 min. The foxes hid the transmitters at the location of Advanced Plastic Surgery Center, 1615 Petroglyph Point Dr. in Prescott. They put out six secondary transmitters. There was some difficulty starting the hunt as the signal could not be heard at the starting point. The foxes made adjustments to the primary transmitter’s location a couple of times before a signal could be heard. My team never heard the signal at the starting point and we had to drive to a high spot on Rosser St. in order to get a signal. The signal was weak and intermittent, but at least we could figure out it was north of our location. In driving to the transmitter site, the signal was in and out until we got relatively close and then we had a good signal that we could hone in on. On our team, K6VVR was the first to find the primary transmitter. We did not hunt all six secondary transmitters. The other two teams did not finish. WB7NFX got called away and his team had to quit the hunt. N7IEP and KF7OLN were unable to find the transmitter and they had to abandon the hunt, but they joined us at the restaurant. All in all it was an interesting hunt. The T-Hunt today was full of twists and turns all the way through. First the primary transmitter stopped working shortly after Bob WB6ODR announced the hunt was on. He tried 2 other antennas but they did not help the problem. Next the secondary transmitter was tried and used as a primary but on a different frequency. The teams seemed to hear it and left the starting point some 30 minutes after the official start time of 1300 hours. They in fact got under way at 1337 hours. Almost an hour later Pete K6VVR and Larry KG7TTD and his son Lance pulled in beside Bob’s car at the hide location. For some reason neither Pete nor Larry could see Bob sitting in the back seat of his car, good window tint perhaps. After they were sure it was Bob’s car, they started looking around but Larry noticed some footprints in the dirt going up a small hill. After 10 or 15 minutes, he came back and turned just a little bit to see where the Fox was tied to a piece of PVC in the ground. Pete climbed up the hill and verified that was the fox. That is when Bob emerged from the car, to their surprise, and the micro foxes were chased down. Car 2 decided after a couple of hours of chasing the signal they were in need of some coffee and did not report a time. Lance alone for the ride and some outside air. 1 WA6FBA and WB6ODR 13 min. 2 K6VVR, KG7TTD and KK6IRY 39 min. Due to the recent snow and rain, plus the forecast for rain and or snow the day of the hunt, Jeff chose a place to hide the transmitters that would keep the hunters away from mud and treacherous surfaces: the shopping center at the NE corner of Montezuma and Sheldon. The primary transmitter was hidden behind the gas line just above the gas meters at the back corner of the Hertz office and the secondary transmitter was placed on the railing attached to the corner column in front of the Enchanted Christmas store. This was one of the shortest foxhunts we have ever had. The winning team took only 13 minutes to find the primary transmitter and the second place team took only 39 minutes. We thought the location of the primary transmitter might cause more difficulty in locating it due to reflections off nearby buildings. I also thought that, since the transmitter was located near the rear of a building bordering Granite Creek Park, the hunters would end up in the park looking for it. With a gate between the shopping center and the park about 30 feet or so from the transmitter, that would not have been too terrible for the hunters. However, they did not end up in the park. KK6IRY enjoyed the hunt and said he plans on attending many more in the future. He moved here just a short time ago. Congratulations to Bob and Robert on their successful hunt. One of our near perfect fall days distracted hunters leaving just one combined team of Pete, K6VVR and Jeff, WB7RFY hunting the cunning Fox. The Bob’s , WB6ODR and WA6FSB used a beam antenna and would occasionally re-aim to cause some unique and frustrating effects. The beam was also laid horizontally which we know from other hunts can add fun and wierd adventure to the hunt. The location was in the parking lot of Gateway Mall just East of Sears using the building to shield the signal from most of Prescott proper, the combined effect was intermittent strong signals in all directions while no or minimal signal was norm most of the time. The ‘trick’ (as always), just follow the signal, had the hunt complete in just under 1 hour. The December hunt will be held Saturday, December 8th with Sherwin, WB7NFX/Don, KI7IOM as the fox. Saturday hunt winner hides at the next Saturday hunt. Sunday hunt winner hides at next Sunday hunt. On Sunday, January 6th, WB7RFY will be hiding the transmitters for your pleasure. All hunts start at the One AZ credit union next to Walgreens at Gail Gardner and Willow Creek at 1:PM. Arrive early for equipment set-up and socializing/familiarization, and allow time for after hunt recap and refreshments at a local venue. The monthly foxhunt was held Sunday, October 7th. Mike, N7IEP was the fox. He hid the transmitters at the edge of the parking lot of neurosurgeon Dr. Thomas at the end of Division St. behind the Prescott hospital. 1 WA6FBA and WB6ODR I hr. 04 min. 2 WB7RFY and WB9VGJ I hr. 21 min. 3 K6VVR and KE7ODP I hr. 25 min. It was an interesting hunt. The fox hid the transmitters just 0.6 miles, as the raven flies, from the starting point. However, the hunters drove quite a few miles in order to find them. Jeff and I were as far east as Yavapai College. Due to the primary transmitter being placed on the rear side of a metal guardrail, the signal seemed rather strong in some places and nonexistent in others. This added to the challenge of the hunt. I used the SigTrax app on my cellphone to create bearings pointing toward the signal. To make this effective, the first two need to be from locations somewhat distant from each other. It turns out the cross points really honed in on the location. However, in driving around in the medical complex, the strength of the signal seemed to be west of the actual location. We knew we were close in the complex, but it was difficult to hone in on the signal. One mistake Jeff and I made was, when we first drove past Dr. Thomas’ office, even though the signal seemed stronger west of it, we failed to drive around to the back side of it where Mike had his vehicle parked. Had we done that, we would have won by 10 or 15 minutes. You can see pictures of the hunt using the URL below. Unfortunately, a rain with a strong wind started shortly before the hunters found the transmitters. Robert and Bob left soon after Jeff and I arrived as they had found the transmitters. Jeff and I left before Diane and Pete got there (We wanted to warm up and dry out at the restaurant. ), so I got no pictures of those teams hunting. The monthly foxhunt was held Saturday, September 8th. Pete, K6VVR, and Gary, K6JXM, were the foxes. There were five teams for this hunt. 1 KI7IOM and WB7NFX I hr. 11 min. 2 WB6ODR I hr. 09 min. 3 AD5SU and KF5LDA I hr. 10 min. 3 N7IEP I hr. 10 min. 4 WB7RFY and WB9VGJ I hr. 20 min. We had a good turnout for this hunt, which is not unusual for a Saturday hunt. The hunt got started about half an hour later than usual as the hunters could not hear the signal at the first two locations the foxes chose. The final location, the overlook on Pioneer Parkway, worked well as the signal could be heard most anywhere. One problem with a good signal in many places is it can be misleading. Jeff and I drove through quite a few neighborhoods chasing the signal, which was very strong in some locations. Once we guessed where the transmitter might be, it took a bit if roundabout driving to get from where we were to the site. Overall, it was a very good hunt with all the teams finding the transmitters. The monthly foxhunt was held Sunday, August 5th. Robert, WA6FBA was the fox. He hid the transmitters on Lot 50 in a subdivision on Enchanted Canyon Way. There was two teams for this hunt. The signal at the starting point was very strong, the strongest we could remember, and so we knew the transmitter was not too far away. Robert used a beam antenna on the primary transmitter which accounted for the very strong signal. Unfortunately, Jeff and I did a lot of driving all around the vicinity of the transmitter. We were close to it when we started and took Ridgewood Drive through the subdivision. However, we neglected to drive down Enchanted Canyon Way and drove around in circles north, south, east and west of the subdivision. We had strong signals in most all places and, with the winding streets and dead end streets all around, we gave up the hunt around 2:15 p.m. The winning team didn’t take long to find the transmitters, just 23 minute. Congratulations to Pete and Gary. The monthly foxhunt was held Sunday, July 8th. Diane, KE7ODP, Jeff, WBu7RFY, and Pete, K6VVR were the foxes. There was just one for this hunt. 1 WA67FBA, WB6ODR, K6JXM, WB9VGJ 1 h. 6 min. The signal was weak at the starting point. Driving on Rosser St. over the hill didn’t seem to help a lot as the signal got lost at spots. However, as we drove farther down the hill toward Rt. 89 and through Cliff Rose subdivision, the signal improved. It looked very much like the transmitter was hidden in the Dells east of Rt. 89. We headed down E. Granite Gardens Dr. to the end, but did not find the foxes. The signal kept showing the transmitter was east of us, so we drove north past the Phippen Museum and when we got past it, the signal indicated we has passed the transmitter. We headed back to the museum, but after a short search around the parking lot, it was obvious the transmitter was not there as the strong signal indicated it was still to our east. We then drove north and headed east on Rt. 89A and exited south on Larry Caldwell Drive. We followed it around a loop to newly graded areas of the new subdivision being ready to be built and found the foxes. It was a short walk to find the transmitters. WA6FBA, WB6ODR, and K6JXM were the first to find the primary transmitter. They were all almost on top of the secondary transmitter and we all knew it was right in front of us. Luckily, I was the first to spot the antenna sticking out of the dirt; the transmitter was totally buried in the dirt. The foxes picked a good spot as with the hills and the Granite Dells, it made a challenging hunt as the signal strength varied considerably. Overall, it was a fun, challenging hunt; the foxes chose the location well. I was unable to attend the foxhunt this month and the information here was provided by Jeff, WB8RFY. The monthly foxhunt was held Saturday, June 16th. Robert, WA6FBA, Bob, WB6ODR, and Gary, K6JXN, were the foxes. 1 K6VVR, KE7ODP, WB7RFY 1 h. 20 min. 2 N7IEP 1 hr. 25 min. 3 N7DMF and family 1 hr. 30 min. The transmitters were hidden at Yavapai College on a hill behind the physics building generally where they were hidden a few years ago. Threats of cancelling due to weather lasted almost up to start time. Both the primary and secondary transmitters were ½ watt transmitters. 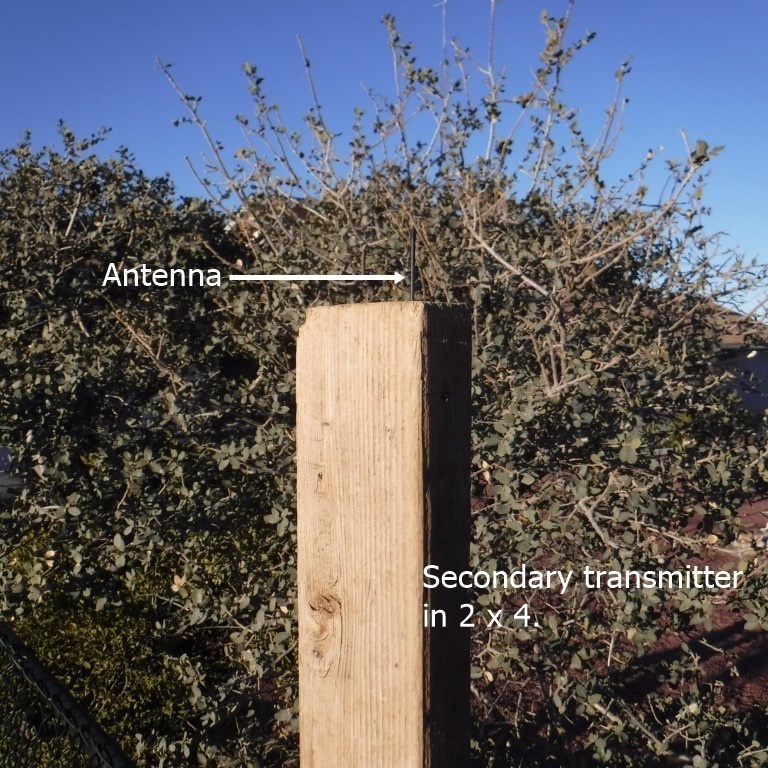 The primary transmitter was ground level on a side of the hill and the secondary was up a tree over a picnic table. The hunt was moist, but never wet and went well with unusual signals that kept all hunters a bit confused. KG7IOM’s wife and children joined in the hunt and it was reported they all had a very good time. It is great to see young folks getting involved. The monthly foxhunt was held on Sunday Saturday, May 6th. Jeff, WB7RFY, Pete, K6VVR and I were the foxes. We hid the transmitters on Sycamore Canyon, a dead end street off of McDonald Dive several blocks east of Senator Highway. It was a gorgeous day for a foxhunt. The primary transmitter was laid down on the horizontal portion on a post holding a for sale sign. The secondary transmitter was hidden in a small bush a little ways down a trail at the end of the street. There was only one team hunting: Robert, WA6FBA, Bob, WB6ODR, Gary K6JXM, and Don, N7PLL. It was a first hunt for Don. There were two women and a man talking in their driveway across the street from where we hid the transmitters. Pete walked over to introduce himself and let them know what we were doing, followed by Jeff and me. Turns out, the one woman’s father used to be a ham and the man is a ham. They understood what a foxhunt was. The team found the location in 31 minutes and WA6FBA found the primary transmitter just eight minutes after that. WB6ODR and N7PLL found it just a couple of minutes after that; they had been in the area for several minutes and walked right by it a few times, not looking up to see it. WA6FBA found it quickly after he got near the sign. K6JXM wasn’t hunting close in and kept the foxes company while the others searched for the transmitters. The monthly foxhunt was held on Sunday Saturday, April 8th. Bob, WB6ODR, and Robert, WA6FBA, were the foxes. They hid the transmitters on a street being extended in The Preserve at Prescott. There was only one team hunting, Jeff, WBRFY, Pete, K6VVR and I. Pete’s usual hunting partner was unable to attend, so Pete rode with Jeff and me rather than try to hunt by himself. We had great difficulty hearing the signal from the primary transmitter, but, surprisingly, we could hear the secondary transmitter. We drove around sort if in a circle from the starting point to not far from Yavapai College to Granite Creek Park and back towards the hospital. We decided to get a bearing from the top of the hill in the Arizona Pioneers Home Cemetery and got a good bearing on both the primary and secondary transmitters. That enabled us to hone in on the location of the hidden transmitters. We got there in about one hour and six minutes. WB7RFY found the primary transmitter shortly after arrival. I then found it and K76VVR found it after talking to the foxes for a while. Apparently, the battery in the primary transmitter was weak, which accounted for the weak signal. 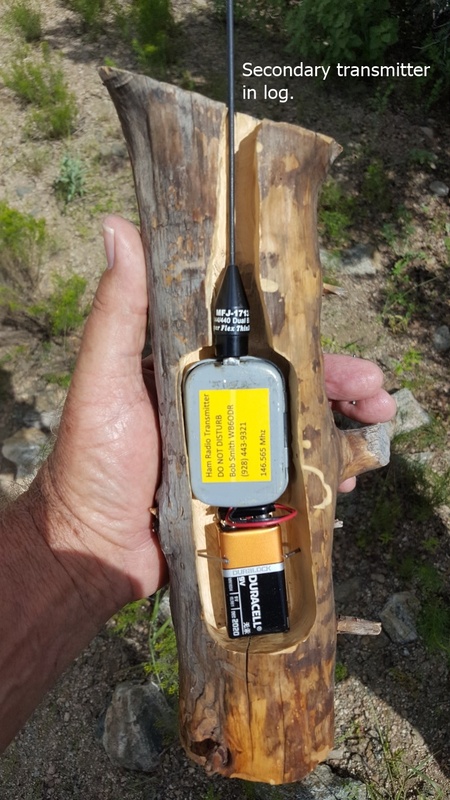 Luckily, the secondary transmitter the foxes used was a 500 mW transmitter instead of the normal 100 mW, which is why we were able to follow its signal on the hunt; we lost the primary transmitter’s signal in may places. The monthly foxhunt was scheduled for Saturday, March 10th. Bob, WB6ODR, and Robert, WA6FBA, were the foxes. They hid the transmitters on the Constellation Trail across Hwy 89 from the Phippen Museum. Unfortunately, due to technical difficulties and the rain, the hunt was cancelled. There was a good turnout. We have three teams ready to hunt comprising eight members. Even though the hunt was cancelled, we had a good time socializing at the Prescott Junction restaurant. Bob and Robert will again be the foxes for the April foxhunt. The monthly foxhunt was held Sunday, February 4th. Jeff, WB7RFY, Joan, KI7PWA, Gary, K6JXM, and I were the foxes. There were two teams for this hunt. 1 WA6FBA, WB6ODR, KW7S 25 min. 2 K6VVR, W7BJ, KE7ODP 1 hr.22 min. We were joined by a new hunter for this hunt: Steve, KW7S. He enjoyed the hunt and said he plans on attending future hunts. It is good to see new hunters getting involved. Joan and Gary have already gotten hooked. She, Gary and Steve learned several things about hunting hidden transmitters on this hunt. Jeff had chosen the roundabout at the entrance to the new The Dells subdivision south of 89A and east of 89. We had a problem at the start of the hunt in that the signal from the primary transmitter could not be heard at the starting point. Once we replaced the vertical whip with a beam, the signal could be heard. The primary transmitter was hidden in in the roundabout and the secondary transmitter was hidden inside the frame of one of the push-loading wheel tractor-scrapers. The area south and east of the roundabout is currently being graded and prepared for building many more houses. I don’t recall seeing so many earth moving machines in one place before. You can get an idea of how much equipment was there in some of the pictures. We had a few folks walking or driving by and one car stopped to talk to see what we were doing. It is always nice to have people ask us so we can explain hidden transmitter hunting to them. Jeff and I ran into a very friendly dog a couple was walking when it ran up to us to meet us. The monthly foxhunt was held Sunday, January 8th. Robert, WA6FBA, and Bob, WB6ODR, were the foxes. 1 WB7RFY, WB9VGJ, K6JXM, KI7PWA 34 min. 2 W7BJ, KE7ODP, KY7SAR 51 min. We were joined by two new hunters for this hunt: Joan, KI7PWA, and Bruce, KY7SAR. They both said they plan on attending future hunts. It is good to see new hunters getting involved. The foxes hid the transmitters just off Dearing Rd. west of Thumb Butte Rd. We had two new circumstances on this hunt. WB6ODR bought four tiny transmitters from Byonics: https://www.byonics.com/ He used them for secondary transmitters and mounted them in pill bottles. They are easy to hide. It made the hunt more challenging. Not all hunters found all four. I, for instance, gave up on one as I got frustrated hunting around a very large boulder. It turns out, the transmitter was hidden in a crack on top of the boulder. With my bad balance, I never would have gone to the top looking for it. You can see pictures of the boulder and of the size of the transmitters using the link below. The other circumstance was a domestic issue. The foxes were at a trailhead on Dearing Rd. A man had dropped off his wife and 1-year-old son and then kept driving up and down the road past the trailhead. Before we arrived, the foxes had called the sheriff’s department. The foxes asked the man to remain by his car, which he did until the deputy arrived. Fortunately, it was a calm situation, but the woman had asked, and the foxes did comply, to drive her home when the hunt was over. After the deputy talked to the man, he quietly left. The woman enjoyed watching the hunters and conversing with some of us and her little boy was enjoying being out in the forest. We had a couple riding bicycles stop to see what we were doing. We explained to them about the hidden transmitter hunt and I showed the husband one of the hidden secondary transmitters. The monthly foxhunt was held Sunday, December 17th. Pete, K6VVR, and Jerry, KF7FPD, were the foxes. 1 WA6FBA, WB6ODR, K6JXM 37 min. We were joined by a new hunter for this hunt, Gary, K6JXM. He and his wife recently moved here from California and he said this was his first foxhunt in 50 years. With him being on the winning team, which found the hidden transmitters quickly, I’m sure he will be spoiled for future hunts, which he says he will participate in. This was a most interesting and challenging hunt. The signal was very weak at the starting point. Jeff and I headed south as we thought the signal would get stronger in that direction. The other team headed west on Iron Springs Road, which turned to be very wise as the transmitters were hidden on Angus Drive between Iron Springs Road and West Pine Lakes Drive. The winning team found the transmitters very quickly. Robert’s Doppler setup works very well. Congratulations to the winners. Jeff and I lost the signal soon after leaving the starting point, so we drove up to the Pioneer Home, figuring we’d get a signal at that high point. We heard a signal for just a couple of seconds, so we had to call the foxes and ask what area we should go to. Having been told the general area, we were able to locate the foxes, but we did not hunt the individual transmitters as we had assistance in finding the hiding location. We’ll hope for better luck next month. The monthly foxhunt was held Saturday, November 18th. Pete, K6VVR, and Patrick, KG7EWD, were the foxes. Sherwin, WB7NFX, and Don, KI7IOM. This was a most interesting and challenging hunt. The foxes hid at a trailhead on a dirt road a little east of a subdivision on the east side of Williamson Valley Rd., north of Pioneer Parkway. Neither team managed to make it to the hidden transmitters. WA6FBA and I saw the foxes rather early on in the hunt. As you can see in the picture of the location of the foxes (the large X on the right), we traveled several streets in the subdivision trying to find a road that led to the foxes. We came very close when we tried Bailey Ave. to West Cliff Rose Rd. We got to the end of the pavement and the dirt road looked rather rough and also looked like it would end in a private driveway. We had already ended up in a couple of private drives, so we did not go down this dirt road. Turns out, it was only a block or so further to the foxes. We did a lot of driving to no avail. It is frustrating seeing the foxes but not being able to get to them. It will make for good conversations on future hunts. This is only about the second time in several years that no teams have found the hidden transmitters. It made for a good discussion at the restaurant afterwards. As a result, Pete and Patrick will be hiding the transmitters for the December hunt. This information was submitted by Robert, WA6FBA. I did not participate in the foxhunt. The monthly foxhunt was held Saturday, October 14th. Robert, WA6FBA, and Bob, WB6ODR, were the foxes. Just another fun filled weekend of Fox Hunting. It doesn’t get much better than this. This hunt was a little more challenging as we had three hidden transmitters. Our hiding spot was next to be baseball fields of the Yavapai College. 34° 32.980 N 112° 27.451 W.
There were two teams for this hunt plus one ham just checking out his equipment. 1 K6VVR and KG7EWD 30 min. 2 WB7RFY and K7IOG 1 hr. 43 min. The main transmitter was hidden in a large cement block water metering box with the antenna hidden in the trees. See the pictures of Jeff and Ernie. Pete and Pat had a heck of a time locating it as the signal was very strong in the tree next to the bench. RF is very sneaky sometimes. The next hunt will be on Saturday, November 11th, 1pm at the Arizona Credit Union, Gail Gardner and Willow Creek. Come on out and join the fun. Even if you don’t have any equipment, we welcome riders so you can see what is involved. The monthly foxhunt was held Saturday, August 12th. Bob WB6ODR, and Bob, WA6FBA were the foxes. There were five teams for this hunt plus one ham just checking out his equipment. 1 K6VVR and KF7FPD 17 min. 4 WB7RFY, WB9VGJ, N7NRE 1 hr. 13 min. † † The foxes were shutting down and time wasn’t noted. The fox picked good a location to hide the transmitters on Katahn Dr. east of Williamson Valley Rd. and a short ways south of Pioneer Parkway. Having the foxhunt on a Saturday turned out very well on this hunt. We had a total of 15 people involved, including the foxes. Two, the team that finished 3rd, were from California. They are working on moving to Arizona. Overall, it was a great hunt, good hiding location and very good participation. The monthly foxhunt was held Sunday, July 9th. Pete, K6VVR, was the fox. 1 WB6ODR and WA6FBA 1 hr. 7 min. The fox picked good a location to hide the transmitters, at the end of Whispering Way Circle, a dead end street off of Lee Blvd. in The Ranch at Prescott. The location was on the east slope of Badger “P” Mountain and the mountain blocked the signal from most of the Prescott basin. It turns out that the hiding place was one that made it difficult for Jeff and me. We heard the primary transmitter’s very weak signal at the starting point, but drove over a lot of Prescott without hearing it at all. When we finally picked it up on entering east Gurley St. we did end up heading in the general direction of the transmitter. However, as WB6ODR and WA6FBA had found it and we knew it would take us a while to find it, we asked where it was and we drove there to see just where the transmitters were hidden. We did not wish to prolong the hunt as we were the only other team. The monthly foxhunt was held Sunday, June 4th. Bob, WB6ODR and Bob, WA6FBA, were the foxes. 1 K6VVR and KG7EWD 1 hr. 9 min. 2 WB7RFY and WB9VGJ 1 hr. 11 min. The foxes picked good spots to hide the transmitters, on the Centennial Trail. WB6ODR parked his pickup across the street a little ways north of the trailhead in a vacant lot as a decoy. WB7RFY and I realized it was a decoy, but failed to notice the trailhead. I did manage to end up on the trail coming in from off the trail. However, as the secondary transmitter was not very far from the primary transmitter, I found the secondary transmitter first and its signal impeded my finding the primary transmitter. The foxes turned off the secondary transmitter and that enabled me to find the primary in good time. However, as WB7RFY and I had stopped to check out empty lots on the north and south sides of the street a 100 yards or so south of the trail where the transmitters were hidden, we lost valuable time, which resulted in coming in second. I had arrived at the location of the foxes 40 minutes before finding the primary transmitter. It was a challenge. After K6VVR found the primary transmitter, the foxes turned on the secondary transmitter so he and KG7EWD could look for it. The monthly foxhunt was held Sunday, May 7th. Pete, K6VVR, and John Kelly, a friend planning on becoming a ham, were the foxes. Jim, KD7NFX, did not officially join the hunt as he is still practicing. He was using an attenuator for the first time and was closing in on the transmitter locations when the hunt officially ended. 1 WB6ODR and WA6FBA 39 min. 2 WB7RFY and WB9VGJ 51 min. The foxes chose a good place to hide the transmitters in a cul-de-sac on a ridge above and behind the Kmart on the corner of Rt. 69 and Prescott Lakes Parkway. It took a little effort to figure out just where the primary transmitter was, even knowing the general location. However, we did get a very good view of the senior center under construction on the ridge above and to the east of Walmart as both teams were up there to take signal strength readings. The weather was not fully cooperative. As both teams were zeroing in on the secondary transmitter, which was very difficult to see in a small bush even though we knew we were right on top of it, the wind got very strong and it started to rain. It was cold and very unpleasant and we all headed back to our vehicles the minute the secondary transmitter was found. The wind and rain prevented me from taking some more pictures of the area. The monthly foxhunt was held Sunday, April 9th. Jeff, WB7RFY, and I were the foxes. I had chosen Vista Park on Sarafina Dr. to hide the transmitters. I was somewhat worried because it was north of the starting point and on the other side of a couple of hills. When we got the transmitters activated, we were unable to bring up the club repeater with our HTs to communicate with the hunters at the starting point, even with attaching a mag mount antenna under the metal roof of the ramada we were in. That made us concerned the hunters would be unable to hear the primary transmitter as it only puts out 500mW. However, after putting my mag mount antenna on a metal bar on a slide in the park about 30’ or 40’ from the ramada, I was able to bring up the repeater. Apparently, the location of the ramada was in a null of the repeater. Luckily, the hunters could barely hear the signal at the starting point. You can see pictures of my HT setup using the link below. 1 WB6ODR, WA6FBA and K6VVR 41 min. We saw two members of the winning team across a gully from the park who recognized us. However, they had to drive a ways to get to the park as there were many streets that were not through streets. Unfortunately, KD7NFX didn’t have an attenuator, so when he got fairly close to the hiding site, he had a full scale reading and was unable to zero in on the primary transmitter. The monthly foxhunt was held Sunday, March 5th. Pete, K6VVR, and Jerry, KF7FPD, were the foxes. Although this was the first month when the distance allowed for the transmitters from the starting point was seven miles (as the raven fliles), extended from the former five miles, the foxes hid the transmitters 3.3 miles from the starting point. Pete and Jerry hid the transmitters on Fawn Lane, the eastern-most street in a subdivision east of Williamson Valley Rd. north of Pioneer Parkway. Although the temperature was near 50 degrees, with the high winds it was very chilly. Thankfully, they did not hide the transmitters far from the street, which minimized the time the hunters had to be out in the cold wind. 1 WB7RFY and WB9VGJ 23 min. 2 WB6ODR, KD7NFX and WA6FBA 25 min. Both teams drove a rather straight path to the hidden transmitters. A two-minute difference between first and second place finish shows they did not waste much time. Their mileage was also close, with Jeff and John driving 8.9 miles and the other team 9.2 miles. It was a competitive hunt. Thanks to Jeff, WB7RFY, for the information for this article and the pictures as I was unable to participate in the foxhunt. The monthly foxhunt was held Sunday, February 5th. Jeff, WB7RFY, and Bob, WA6FBA, were the foxes. They chose the parking lot of the former Outback Steakhouse in the Frontier Village shopping center to hide the transmitters. This area is a good location as, with signal reflections off the surrounding hills and mountains, it can make the hunt challenging: Is the transmitter in the shopping center? Is it on one of the streets above or behind the center? The primary transmitter was hidden in a sizeable pine tree at the east edge of the parking lot and had a 7-foot antenna. The foxes had two secondary transmitters for this hunt instead of the usual one transmitter. One of them was magnetically attached to a guardrail between the parking lot and Hwy 69. The second one, an ultra-low power transmitter, was attached to a vehicle. Pete, K6VVR and Jerry, KF7FPD. They were successful; all three transmitters were found in one hour and twelve minutes. Everyone had their usual after hunt socializing session at Prescott Junction. The monthly foxhunt was held Sunday, January 8th. Bob, WB6ODR, and Larry, KG7TTD, were the foxes. We were fortunate with the weather being the best it had been for several days. Bob and Larry picked a good spot to hide the transmitters – at the east end of East Butterfield Rd. overlooking the Pioneer Village shopping center. This spot had been used once in the past and was very challenging for the hunters. Unfortunately, there was only one team of hunters for this hunt, Jeff, WB7RFY, and I. We found the transmitter in 56 minutes. We could have found it quicker except that we tried a nearby road where we thought the transmitter might be first. It was very narrow and finding a place to turn around was not exceptionally easy. I use a neat app on my smartphone called SigTrax. When you aim an antenna at a radio signal, the app allows you to manipulate a bearing line on the phone’s screen so it is pointing in the same direction and then save that bearing. After taking several bearings, if they are accurate, there will be intersections. Those intersections will give one a good idea of where the transmitter is hidden. As one has to guess when aiming the antenna just where the center of the signal is, it can be somewhat wide, the bearing lines are not 100% accurate, but can be very close. You can see how close they were in this hunt in the screenshots I took of them on my smartphone. Those screen shots are in the pictures you will find using the link below. The monthly foxhunt was held Sunday, November 6th. Pete, K6VVR, and Patrick, KG7EWD were the foxes. Jeff and Pete found an excellent, hard-to-find location to hide the transmitters: on Upper Sky Terrace Drive off of Senator Highway. A parallel, dirt street, Sky Terrace Drive is just a little south it. It does connect to Upper Sky Terrace Drive up a steep hill at its end. All teams except the winning team found the transmitters by driving in on Sky Terrace Drive. As you can see in the pictures, it doesn’t look like much of a road and it seems more a private drive in the upper portion than a public street. It made a somewhat challenging approach. There were four teams for this hunt and we had some new hunters involved. 1 Robert and Larry 32 min. 2 Bob and grandson 1 hr. 8 min. 3 Dave and Alan 1 hr. 25 min. 4 Jeff and John 1 hr. 34 min. Robert discovered he had his Doppler antennas hooked up improperly last month. His result in so quickly finding the transmitters showed that his Doppler system works extremely well when set up correctly. Congratulations to Robert and Larry on their success. The monthly foxhunt was held Sunday, November 6th. Jeff, WB7RFY, and I were the foxes. We were accompanied by Mark, N7KKQ, a fellow ARCA member with Jeff, who was up from Glendale visiting. Jeff chose the location for hiding the transmitters, Petroglyph Point in Prescott Lakes subdivision. It was a great location as it offered a fantastic a 360-degree view. One can see Mingus Mountain, Mt. Francis, the San Francisco Peaks, Bill Williams Mountain, Thumb Butte, Granite Mountain, and many others in all directions. He hid the primary transmitter and I hid the secondary one. There were three teams for this hunt. 1 Dale and Chris 43 min. 2 Pete and Patrick 54 min. 3 Bob and Robert 1 hr. 10 min. I had thought, due to the location and the winding streets and less than straightforward access, that not all the teams would find our location. I was wrong; all the teams did find the location and the transmitters. That is the best way for a hunt end. A plus was that the weather was just perfect. The monthly foxhunt was held Sunday, October 8th. Bob, WB6ODR, Linda,KD7EEO, and Robert, WA6FBA, were the foxes. The foxes chose Stricklin Park,between Sherwood Dr. and Hassayampa Village Lane, to hide the transmitters.For this hunt, there were two secondary transmitters instead of the usual one.Each fox was sitting comfortably in a folding chair, one near each transmitter, sothey could easily monitor the hunters and see just when they found eachtransmitter. Having the two secondary transmitters on the same frequency did notseem to pose a problem as the distance between them was sufficient to allow thehunters to zero in on each one. 1 Jeff, WB7RFY, and I 1 hr. 2* Pete, K6VVR, and Frank, KF7ANX 1 hr. 15 min. *Pete was very close to the primary transmitter and heading straight for it when the transmitter stopped transmitting. The foxes chose good hiding places, putting the primary transmitter behind a large rock under dead limbs and pine needles. 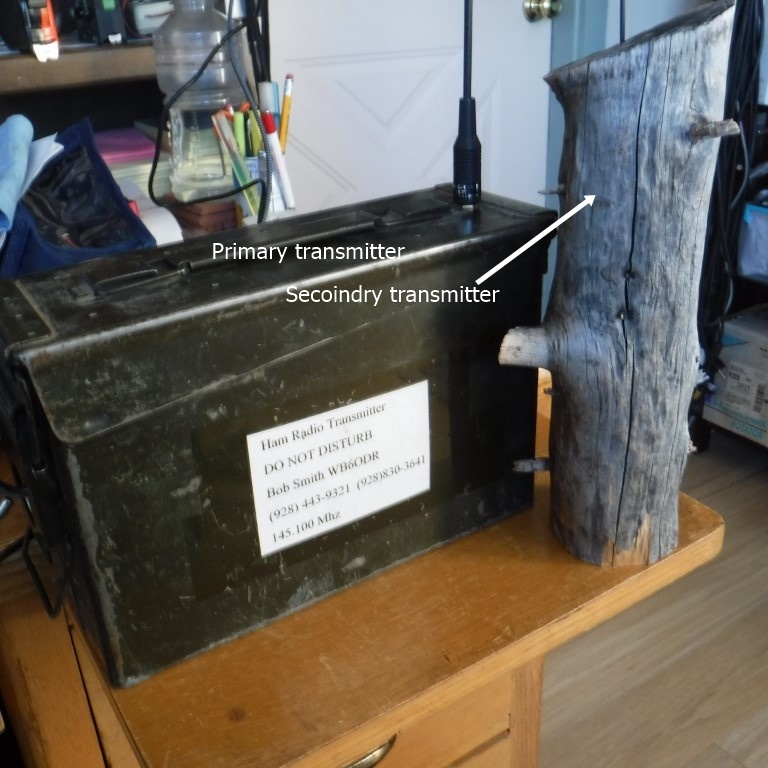 They brought out the small log witha cutout in it for the transmitter, used in a former foxhunt, for one of the secondarytransmitters. They stood it up at the base of a bush making it difficult to notice.The other secondary transmitter was on a pine tree limb. It is interesting how many hunters don’t tend to look up when they are close to a transmitter. We would encourage more folks to get involved in the hidden transmitter hunts. They are really fun and help develop direction-finding skills. There were just two teams for this hunt. Robert, WA6FBA, and Bob, WB6ODR. This was a fairly short hunt as both teams found the transmitters rather quickly. It speaks to their foxhunting skills. However, once they arrived at the library, they did spend some time near both transmitters before they located them; they were close and walked right past them several times. Congratulations to Pete and Patrick for winning the hunt. Due to a request from the Embry-Riddle members who were the successful hunters in April, Jeff, WB7RFY became the fox for May. The main transmitter was concealed in tall bushes in front of the old theatre on Marina St. Several downtown events assured that the area would be busy. The secondary was magnetically attached to the base of a parking sign in a lot just up the block. The cloudy weather and seemingly not so sinister weather forecast may have caused some to miss, but one intrepid hunter was hardly enough to proceed. Robert, WA6FBA departed the start at 1:00 PM, and was within feet of the main transmitter at 2:17; but an overloaded receiver didn’t allow him to pinpoint the location for another 20 minutes. The Fox remains with the Eagle Radio Club at ERAU for the June hunt. We had our usual after hunt socializing session at Prescott Junction We would encourage all to get involved in the hidden transmitter hunts. They are really fun and help develop direction-finding and radio skills. The monthly foxhunt was held Sunday, April 10th. The foxes were Dave, W7BJ, Pete, K6VVR, Diane, KE7ODP, and Patrick, KG7EWD. They hid the transmitters on a dead end street in Cliff Rose, very close to the intersection of Prescott Lakes Parkway and Rt. 89. Bob, WB7FBA, was at the starting point. He is getting back into amateur radio after a long absence. He was invited to join Jeff and me, but declined. He said he just wanted to test some equipment and did not plan on finishing the hunt. We hope we’ll see him again in the future. Congratulations to Clayton, Brian and Forrest for winning the hunt. We had our usual after hunt socializing session at Prescott Junction. We would encourage more folks to get involved in the hidden transmitter hunts. They are really fun and help develop direction-finding skills. The day started out like many others in the Prescott area, except, today it was blowing like a hose. The wind was a real factor in today’s hunt, antennas were bent every way and the signal seemed to be coming from anywhere. A good signal was being received at the start point. At some point during the hunt the primary transmitter went off the air. When Bob discovered it he got so flustered that he did not write down any arrival times for the various members or teams. Pete K6VVR was the first person to walk to the secondary transmitter as that was the only signal left on the air. Reports say the secondary transmitter was almost as strong at the start point as the primary transmitter at the beginning of the hunt. Good food and stories were had at the Junction afterwards. The fox extends the most humble apologies to all hunters for not having a well changed battery. It will not happen again. Luckily, all teams got close enough to the hiding places to hear the secondary transmitter and find the hiding places. K6VVR was the first to find the secondary transmitter, so he and his teammate W7BJ were the winners. W7BJ, WB7RFY, KC0TGG and I found the transmitter just a minute or two after K6VVR. WH6EAL and KK7PGR found it about 20 minutes or so later. They had come up Commerce Drive and were the only team that did that. They spotted one of Bob and Linda’s cars parked in the parking lot by the ballfield as a decoy, so they ran up the trail to where the transmitter was hidden. It was about a mile, all uphill, to the transmitter. Congratulations to Pete and Dave for winning the hunt. The monthly foxhunt was held Sunday, February 7th. The foxes were Forrest, WH6EAL, and Braden, KG7GLX. 3K6VVR and KE7ODP1 hr. 15 min. 1 WB6ODR and KD7EEO 0 hr. 29 min. 2 W7BJ and KC0TGG 0 hr. 49 min. 4 WB7RFY and WB9VGJ 1 hr. 23 min. Congratulations to Bob and Linda on winning the hunt in excellent time. The foxes found good places to hide the transmitters on a trail crossing Granite Basin Road. The secondary transmitter was very difficult to spot, even when one knew he/she was close to it. We had our usual social get-together after the hunt at Prescott Junction Restaurant. Often, the camaraderie after the hunt is just as much fun as the hunt itself. It is always enjoyable. The monthly foxhunt was held Sunday, January 12th. Diane, KE7ODP, Dave, W7BJ, and Pete, K6VVR were the foxes. They picked a place on Ventnor Circle, high on a hill in Cliff Rose overlooking the Prescott senior center. 1 KB7GLX and WH6EAL 1 hr. 50 min. DNF WB7RFY and WB9VGJ 2 hr. 30 min. Congratulations to Braden and Forrest on winning the hunt. Jeff and I did not finish. We had so many signals indicating different locations that it became somewhat frustrating. We were getting close to the hidden transmitters when we gave up after 2-1/2 hours and asked where they were. Upon arriving at the location, we discovered an element on Jeff’s antenna had broken, which was the cause of the erroneous signals. That had happened on one hunt in the past. Jeff will be rebuilding the antenna before the next hunt. The monthly foxhunt was held Sunday, December 6th. Al, AF6ZR, and Ron, KC0TGG, were the foxes. They chose an excellent location on a couple of trails at the end of a short dead-end road off of White Spar Road two streets north of the Comfort Inn. 1 K6VVR, W7BJ, KG7EWD I hr. 7 min. 2 WB7RFY & WB9VGJ 1 hr. 9 min. 3 WB6ODR, KD7EEO 1 hr. 16 min. The winners won by a close margin again this month, a margin of two minutes, just as in the November hunt. All the teams found the transmitters and the times were close for everyone. This was a surprise to all of us due to the excellent location that was chosen. KC0TGG admitted he ran across this location by accident. It turned out to be a fortunate accident, indeed. Congratulations to Pete, Dave and Patrick for being the winners! Diane, KE7ODP, who could not make this hunt, will be joining them in hiding the transmitters in January. Knowing how devious Diane can be, it should be an interesting and challenging hunt. The monthly foxhunt was held Sunday, November 9th. Forrest, WH6EAL, was the fox. He chose a location on a trail adjacent to the Hassayampa Golf Course, which made the hunt interesting for some of us as we knew it was on the west side of the golf course, but had some difficulty figuring out which public road we could take to get to it. Two teams did not have difficulty finding the way to get to the transmitters. 1 KC0TGG, AF6ZR I hr. 6 min. 2 WB6ODR 1 hr. 9 min. The winners won by a close margin, as you can see. The other two teams found the location after time ran out. Also, the transmitter had stopped transmitting, so Forrest had to turn it back on, which gave me a clue as to where it was as I was not far behind him when he went to turn it on. It was a challenging hunt and everyone had a good time. Congratulations to Al and Ron for being the winners! The monthly foxhunt was held Sunday, September 6th. Ron, KC0TGG, Jeff, WB7RFY, and I were the foxes. Ron had chosen the site, a good one. It was near the end of Butterfield Dr. above and behind the Frontier Village shopping center, just at the locked gate. He had figured there’d be a strong signal at the starting point as there was a clear line of sight between there and the transmitters, but the signal would weaken and/or disappear as hunters drove up and down hills on the hunt. He was correct. Ron left his truck parked in the shopping center as a decoy, thinking hunters would see it and think they were close to the transmitters. He was correct; at least one team did see it and think that. There were six teams of hunters, but only two found the transmitters before the official end of the hunt at 3:00 p.m. Bob, WB6ODR, and Linda, KE7EEO, won. Dave, W7BJ, arrived shortly before 3:00 p.m. and found the primary transmitter right at 3:00 p.m. when the hunt officially closed. Talk about sneaking in under the wire! 1 WB6ODR & KD7EEO 42 min. 2 W7BJ 2 hr. 57 min. Congratulations to Bob and Linda for winning the hunt! The monthly foxhunt was held Sunday, July 5th. Byon, N6BG, and his wife Lara, KD6AYO, drove up from Chandler and hid the transmitters. They hid five transmitters in various locations on the Embry Riddle Aeronautical University campus. They were transmitting on different frequencies at 15 mW of power with duty cycles of about 15 seconds on and 12 seconds off. It made for a very interesting and fun hunt. It was a new experience and everyone seemed to enjoy it very much. Some hunters walked to most or all of the transmitters, while some drove until they were close to the transmitters and then got out and finished on foot. None of the transmitters were all that far away from a road or parking lot. 1 WB6ODR & KD7EEO 5 1 hr. 54 min. 2 K6VVR & KE7ODP 4 1 hr. 53 min. 3 W7BJ & KF7ANX 5 2 hr. 02 min. 4 WB7RFY & WB9VGJ 3 2 hr. 05 min. The monthly foxhunt was held Sunday, June 7th. Forrest, WH6EAL, was the fox. Ron, KC0TGG, and Al, AF6ZR. Pete, K6VVR, Dave, W7BJ, and Diane, KE7ODP. Byon, N6BG, and his wife. Forrest found good hiding places for the transmitters along Skyline Drive in Highland Pines. The transmitters were just inside the 5-mile-as-the-raven-flies limit in the foxhunt rules. We can depend on Forrest to always check out the 5-mile limit when he’s the fox. Congratulations to N6BG for winning the hunt. Next month, the hunt will be a different variety. Byon is going to hide five transmitters on different 2M frequencies and hide them all on the Embry-Riddle Aeronautical University campus. They will be on about a 50% duty cycle. It ought to be a very interesting and challenging hunt. The start time and location will be the same, the parking lot of the Arizona Credit Union on Gale Gardner Way. The monthly foxhunt was held Sunday, May 17th. It was postponed one week due to Mother’s Day. Jeff, WB7RFY, and I were the foxes. We lucked out with nice weather, sunshine and no rain with comfortable temperatures. Bob, WB6ODR, and Linda, KD7EEO. Dave, W7BJ, and Frank, KF7ANX. Randy, W6TYV, and Diane, KE7ODP. Al, AF6ZR, and Ron, KC0TGG. We hid the transmitters at the south end of Acker Park, along the Barrie Mayes Memorial Trail System, just north of the trailhead at the north end of the dead-end street Autumn Breeze Rd. Jeff had figured this would make a challenging hunt as hunters might have a good idea where the transmitters were, but have some difficulty getting to them, especially if they went to the cemetery at the south end of Virginia St., which was a ways north of the location of the transmitters. One team did go there and met Peter, W7PRG, and thought they were close to the transmitters. However, Peter was not involved in the hunt. That strategy, however, didn’t seem to have a negative impact on some of the hunters, especially the winner of the hunt, WH6EAL. Forrest found the primary transmitter in just 27 minutes, followed by the second place team, W7BJ, and KF7ANX, who found it in 44 minutes. In third place were KC0TGG and AF6ZR, followed by WB6ODR (KE7EEO remained in the car reading a book she had gotten very interested in.). W6TYV and KE7ODP, were closing in on the location but were not able to find it before the time ran out at 3:00 p.m.
Congratulations to WH6EAL for winning the hunt. I am sure Forrest will be very ingenious when hiding the transmitters for the June hunt. See pictures of the hunt. The monthly foxhunt was held Sunday, April 12th. It was postponed one week due to Easter. The foxes were Forrest, WH6EAL, Brian, KK6PGR, and Clayton, KJ6QJS. Pete, K6VVR, Dave, W7BJ, and Patrick, KG7EWD. The foxes created a challenging hunt, hiding the transmitters on a dead-end street, Bar-Circle-A Rd., in Yavapai Hills subdivision above the north side of Walmart on Rt. 69 and Prescott Lakes Parkway. During the hunt, the foxes were relaxing on In-N-Out Burger’s patio where they could keep a watch on hunters as they closed in on the transmitters on the high ridge behind the store. WB7RFY and I were fortunate to be the winners of the hunt, finding the primary transmitter 14 minutes quicker than the second place team, AF6ZR and KC0TGG, in times of 1 hr., 16 m. and 1 hr., 30 min., respectively. The third team, K6VVR, W7BJ and KG7EWD did not complete the hunt as they arrived at Walmart with too little time left to find the transmitters. They were sitting on the patio at In-N-Out Burger when we drove down to there after finishing the hunt. The foxes were very creative in hiding the secondary transmitter, as you can see in the pictures using the link below. There was an excavator parked along the street where the primary transmitter was hidden. The secondary transmitter was attached via magnet under the cab of the excavator. It gave Jeff and me fits as we knew we were close to it, and the strongest signal was right at the cab, but it took some time before we thought to look at the underside of the cab; we were looking all around in the tracks on both sides of the vehicle. It made for a very challenging search. We had our usual social get-together after the hunt, this time at In-N-Out Burger as it was so convenient and half the guys where already there. It was another fun Sunday in beautiful, sunny Arizona. See pictures of the hunt here. The monthly foxhunt was held Sunday, March 8th. Jeff, WB7RFY, and I, WB9VGJ, were the foxes again as no hunters found the hidden transmitters before the time ran out last month. Randy, W6TYV and Tracey, KE6QZD. Diane, KE7ODP, and Patrick, KG7EWD. Clayton, KJ6QJS, Brian, KK6PGR, and Forrest, WH6EAL. Ron, KC0TGG, and Dave, W7BJ. It was a successful hunt and all hunters arrived at the park and only a couple failed to find the primary transmitter and only a couple failed to find the secondary one. I had promised the hunters a less challenging hunt this month. I chose Pioneer Park as the place to hide the transmitters. We hid the primary transmitter in a tree branch a short way off the trail to some picnic tables. Jeff picked the spot for the secondary transmitter and buried it in a sand pile. I buried a Styrofoam cup I found on the ground a few feet away from the transmitter as a decoy and several hunters did look under it only to find the transmitter wasn’t there. Randy and Tracey were the first ones to arrive at the park. However, they were not the first to find the transmitters as Randy didn’t have sufficient attenuation to be able to do so. I discovered that, at the location from which Jeff and I watched the hunters, the signal from the primary transmitter was just as strong directly away from it as facing it. Forrest and his team were the first to find the primary transmitter, with Forrest being first on the team. The certificate that Jeff has made for the winner(s) of the hunt was made out to N7ERU, the Eagle Amateur Radio Club at Embry-Riddle Aeronautical University, as the winning team members are all members of the club and they wanted some wallpaper for their ham shack. Congratulations to Forrest, Clayton and Brian! Forrest promised a challenging hunt in April. We had our usual social get-together after the hunt. It was another fun Sunday in beautiful, sunny Arizona. The monthly foxhunt was held Sunday, February 7th. The foxes were Jeff, WB7RFY, and I, WB9VGJ. Jeff had picked an excellent place to hide the transmitters, on a dead-end road off of West Lonesome Hawk Dr. in Highland Pines. While hunters had to drive past the 5-mile-from-the-start limit for hiding the transmitters to find the transmitters, they were just 4.27 miles from the starting point, as the raven flies. Randy, W6TYV and Al, AF6ZR. Pete, K6VVR, Diane, KE7ODP, Patrick, KG7EWD, and friend John, no license yet. Clayton, KJ6QJS, Brian, KK6PGR, and Braden, KG7GLX. Ron, KC0TGG, and friend (another) John, no call yet. Forrest, WH6EAL, was unable to join in the hunt as he was working SOTA (Summits on the Air). However, Jeff and I did talk to him on 2 meters, both through the club repeater and simplex when he was up on Mt. Humphries at Flagstaff. That was a pleasant surprise. When we set up the transmitters, I told Jeff I didn’t think anyone would find them. It turned out to be a first for a YARC foxhunt in that no hunters found the transmitters before the allotted time was up. However, some were rather close. As a result, Jeff and I will be the foxes for the March hunt. I promised the hunters I would find a place that was less challenging. I do think they believed me. Even though no one found the transmitters in the allotted time, we gave the hunters the location so they could come and see where they were and realize how close they had come to finding them and to give them an idea how well their direction-finding had been working. All the hunters appreciated seeing the locations and we got positive feedback. The monthly foxhunt was held Sunday, January 11th. The foxes were Diane, KE7ODP, Pete, K6VVR, and Patrick, KG7EWD. Forrest, WH6EAL, and Randy, W6TYV. Jeff and I were fortunate and won the hunt, with Forrest and Randy coming in second. Bob decided to give up the hunt and was given the location and came to it. We won with a nice margin of approximately 45 minutes. We also drove the fewest miles to find the transmitter, 8.9 miles as compared to 22.7 miles for Forrest and Randy and 21.8 miles for Bob. I again used the SigTrax app on my smartphone (You can see a screenshot of it in my pictures, link below.) to assist in getting bearings on the transmitter’s signal. While it is difficult to be ultra-precise, the bearings did head us in the correct direction and help us hone in on the transmitters quickly. The signal at the starting point was weak and appeared to come from the southeast towards downtown. The other two teams drove south from the starting point. In hunts past, Jeff and I had also headed south with the signal was weak and apparently coming from that direction, only to find that the transmitters were north of the starting point. The hills and rocks make for confusing signal reflections. So, we headed east and then north to Rosser and by doing that we discovered the transmitter was north of us. That facilitated our shorter time and fewer miles to find the transmitter. Sometimes, one has to go with one’s gut even when the equipment might indicate something else. We had our usual after-hunt get-together at Prescott Junction Restaurant. The social aspects of the hunts are as enjoyable as the actual hunts.